Crimmins thrilled bowling fans by sharing in every conceivable bowling title – team, doubles, singles and all-events in local, state and national competitions. The 1941 season was a particularly rugged test. In a stretch of eight weeks, he won four major tournaments in four states: the Buddy Bomar Classic in Dallas, the Skang Mercurio Singles Tournament in Cleveland, the first National All-Star Tournament in Chicago (on Pearl Harbor Day, Dec. 7, 1941) and the Rose Bowl Singles Classic in California. From 1936 through 1940, he averaged 215 for 45 games to win the Elks National Tourney. In four decades, he was a winner of nearly 100 bowling titles in major tournaments. Crimmins averaged 195 in 40 American Bowling Congress tourneys. Crimmins developed a tight hook that covered only six boards as he carried high and thin hits. Consequently, John was bothered less by varying lane conditions than other bowlers. He gave little lift on the ball as he released it to make it break. Crimmins registered a grand sweep in the Elks National Tourney. From 1936 through 1940 he averaged 215 for 45 games. The 1941 season was a torrid one for John. In a two-month stretch, he won four major tournaments in four different states. On October 27, he captured the Buddy Bomar Classic in Dallas with an eight game total of 1,737. Thirty-two days later, Crimmins won the Skang Mercurio Singles Tournament in Cleveland with a 217 average. John won the first National All-Star Tournament in Chicago on December 7, 1941. His victory was overshadowed by the historic events unfolding at Pearl Harbor that day. The following week he traveled to Temple City, California and won top money in the Rose Bowl Singles Classic with a 1,009 total for five games. Four championships and $4,200 in prize money in eight weeks across strange lane conditions. It has to rate as one of the greatest feats in bowling history. 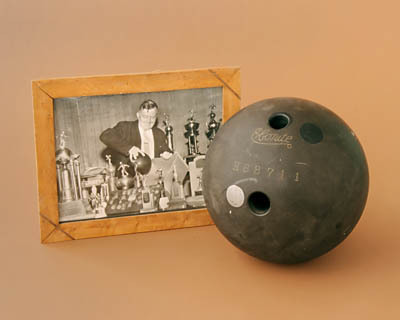 Crimmins was voted “Bowler of the Year 1942″ by the nation’s bowling writers. John shared in every conceivable bowling title – team, doubles, singles and all-events. These championships came in city, state, ABC and world’s match game competition. In 40 American Bowling Congress Tournaments, Crimmins averaged 195.